Boston suburbs Cambridge police and the Middlesex District Attorney’s office confirmed a MIT campus police officer was shot dead responding to a report of a disturbance when he was fired upon multiple times. 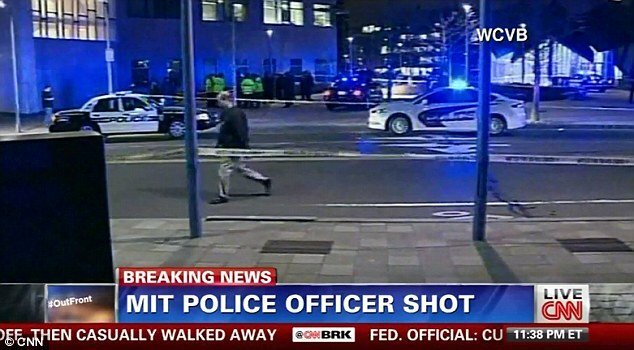 Initially, the officer was taken to Massachusetts General Hospital with life threatening injuries but he later died. His name was not immediately released. State police spokesman Dave Procopio says the shooting took place about 10:30 p.m. outside a Massachusetts Institute of Technology (MIT) building. Dave Procopio says authorities are searching for a suspect or suspects. No arrests have been made. The campus website said police were sweeping the campus and urged people to stay indoors. In a statement issued to the press, law enforcement officials said that no arrests have been made in the shooting and the search for a suspect or suspects is ongoing. MIT in Boston issued an emergency alert at 10.48 p.m. on Thursday night reporting that shots had been fired putting an officer was down and that a shooter was on the run. It has been reported that a “Hispanic looking man” took the officer’s weapon from him before firing on him. MIT posted this alert to their website: “At 10:48 PM today gunshots were reported near Building 32 (Stata) which is currently surrounded by responding agencies. “The area is cordoned off. Please stay clear of area until further notice. Unknown if injuries have occurred. Although the situation is considered active and extremely dangerous, an investigation is underway. The school is describing the situation as “active and extremely dangerous” – and FBI agents have been witnessed at the scene. Boston has been on edge after two bombs ripped through the crowd near the finish line of the Boston Marathon, killing three people and injured 183 more.